Arcanum’s Dylan Rhodehamel earned a pin win in 1:58 over Kyle Donohoo of Tri-County North in a dual match with the Panthers on Monday. TCN won the match, 40-24. Arcanum’s Braydin Gillem wrestles Dixie’s Austin Thrasher at 145 pounds on Monday. Gillem earned a pin win at 2:51 over Thrasher helping the Trojans to a team win 30-21 over the Greyhounds. 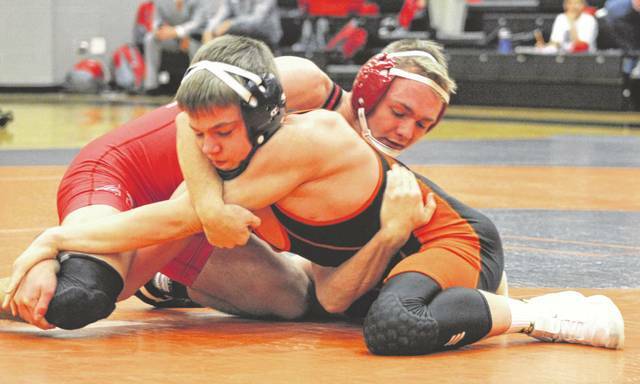 Arcanum’s Cameron Haney wrestles against New Lebanon Dixie’s J.C. Fox at 120 pounds on Monday in a dual match. Fox earned the win over Haney in a close 7-6 decision. The Trojans won the team match, 30-21. 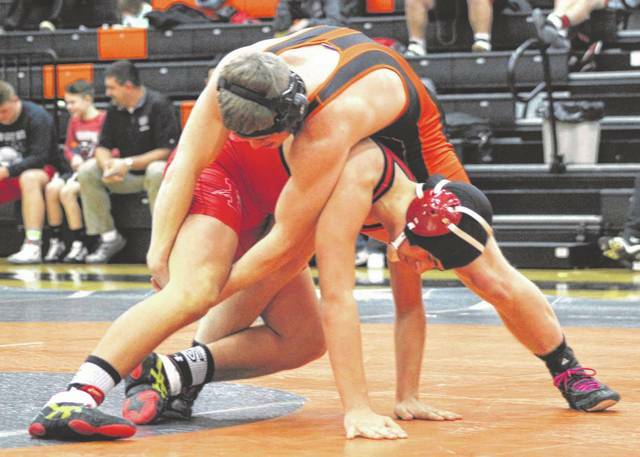 Arcanum’s Devin Keckler picked up a pin win in 1:01 over Dixie’s Colton Blosser in a dual match on Monday night. The Trojans also defeated the Greyhounds in the team match, 30-21. Arcanum’s Jack Reed wrestles against Tri-County North’s Wyatt Woodyard at 195 pounds. Woodyard earned a pin win over Reed at 1:40 of the match and the Panthers won the team match, 40-24. 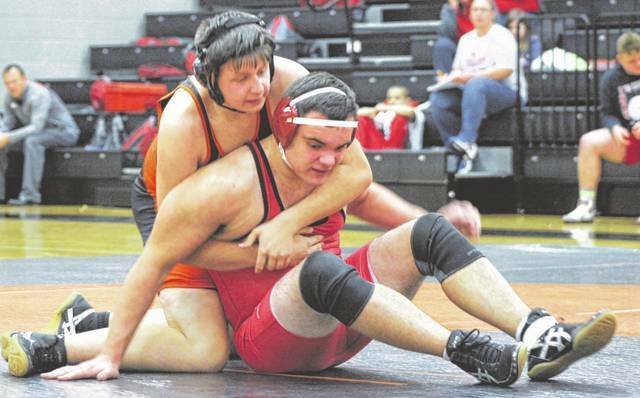 ARCANUM – The Arcanum wrestling team earned a split with New Lebanon Dixie and Tri-County North in a home tri-match on Monday. Behind wins from Braydin Gillem at 145 pounds and Devin Keckler at 152, the Trojans were able to defeat Dixie 30-21 in the second match of the night. Tri-County North defeated Dixie 41-8 in the first round. Gillem defeated Austin Thrasher by pin at 2:51 of the second period for his win, and the Keckler was the next match on the mat against Colton Blosser and he wasted no time in getting his win by pining Blosser at 1:01 of the first period. Because of low numbers for Dixie, Arcanum also picked up three wins by forfeit for Christian Snyder at 106, Cael Gostomsky at 170 and Dylan Rhodehamel at 182. There were several double forfeits as well as 113, 160, 195 and 285. 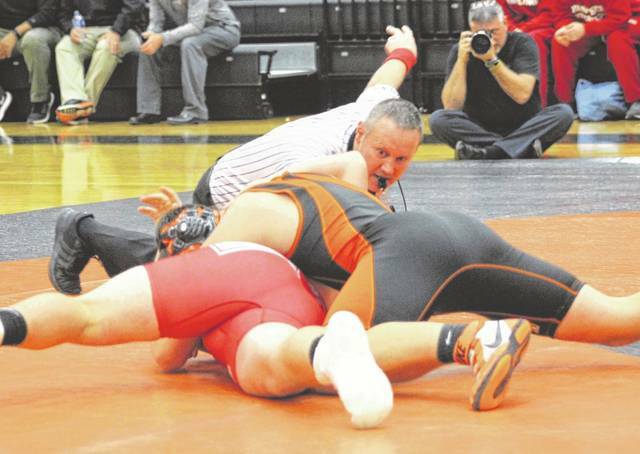 In the final match against Tri-County North, Arcanum was the victim of not enough wrestlers in falling to the Panthers, 40-24. The Trojans trailed by 10 points 22-12 after a surprising upset by Zane Krull over Keckler at 160 pounds. Keckler had a four-point lead with seconds to go, but got pinned at the 5:42 mark of the third period. Arcanum did regain the lead after both Gostomsky and Rhodehamel picked up pin wins at 170 and 182 pounds respectively. Gostomsky pinned TCN’s Dylan Curtin at 1;29 of the first period and then Rhodehamel pinned Kyle Donohoo at 1:58 of the first period. 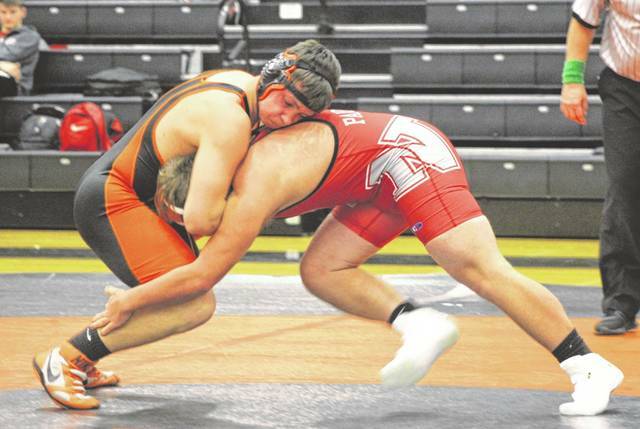 Those two wins pushed the Trojans ahead of the Panthers 24-22, but with Arcanum having to forfeit at 220 and 285 they simply didn’t have enough to pull out the win. “It was a close dual with Tri-County North, but not the result we were hoping for,” Beatty said. “They beat us to start the season, then we beat them a couple weeks later and they beat us real close here tonight. My senior state qualifier (Ethin Hoffman) was out sick today, so that hurt us, and we are waiting on our heavyweight to get back from his injury during football. When we get healthy I think we’ll be doing a little bit better. Beatty did give out some praise to his wrestlers. ”Cameron Haney stood out today,” Beatty said. “He lost 7-6 to J.C. Fox from Dixie, who is a really good wrestler, and then he bumped up a weight to wrestle Hunter Heck and picked up a big win there. He is a district qualifier from last year as a freshman. Hopefully him and Ethin (Hoffman) can get together here toward the end of the year and push together and try to make it to state. 106: Christian Snyder (Arcanum) won by forfeit; 113: Double forfeit; 120: J.C. Fox (Dixie) dec. Cameron Haney (Arcanum), 7-6; 126: Dustin Simon (Dixie) won by forfeit; 132: Double forfeit; 138: Brian Blosser (Dixie) pin Devon Kuhbander (Arcanum), 3:57; 145: Braydin Gillem (Arcanum) pin Austin Thrasher (Dixie), 2:51; 152: Devin Keckler (Arcanum) pin Colton Blosser (Dixie), 1:01; 160: Double forfeit; 170: Cael Gostomsky (Arcanum) won by forfeit; 182: Dylan Rhodehamel (Arcanum) won by forfeit; 195: Double forfeit; 220: Ashton Cassidy (Dixie) pin Jack Reed (Arcanum), 2;36; 285: Double forfeit. 106: Christian Snyder (Arcanum) won by forfeit; 113: Double forfeit; 120: Double forfeit; 126: Cameron Haney (Arcanum) pin Hunter Heck (TCN), 5:43; 132: Ethan Fitch (TCN) won by forfeit; 138: Chase Eby (TCN) pin Devon Kuhbander (Arcanum), 3:08; 145: Mason Hesler (TCN) dec. Braydin Gillem (Arcanum), 12-5; 152: Double forfeit; 160: Zane Krull (TCN) pin Devin Keckler (Arcanum), 5:42; 170: Cael Gostomsky (Arcanum) pin Dylan Curtin (TCN), 1:29; 182: Dylan Rhodehamel (Arcanum) pin Kyle Donohoo (TCN), 1:58; 195: Wyatt Woodyard (TCN) pin Jack Reed (Arcanum), 1:40; 220: Clayton Finney (TCN) won by forfeit; 285: Wyatt Hutchins (TCN) won by forfeit.